Is this King Arthur's original round table? No. There probably never was one. But because of a revival of interest in the Arthurian legends in the late 13th century, Edward 1st had this constructed about 1280 (carbon dating of the wood confirms this date). It was probably built in the Great Hall, of 121 pieces of oak from seven oak trees, weighing one ton, four hundred weight. The twelve legs, plus the 13th central leg are missing. In the early part of Henry 8th's reign, about 1510, a revival of interest in Arthur caused Henry to have this painted. His father, Henry 7th, was anxious to establish his true right to the throne after the Wars of the Roses so links to Saxons and Britons were found. Henry 7ths first son was named Arthur, but after he died Henry 8th inherited the throne. 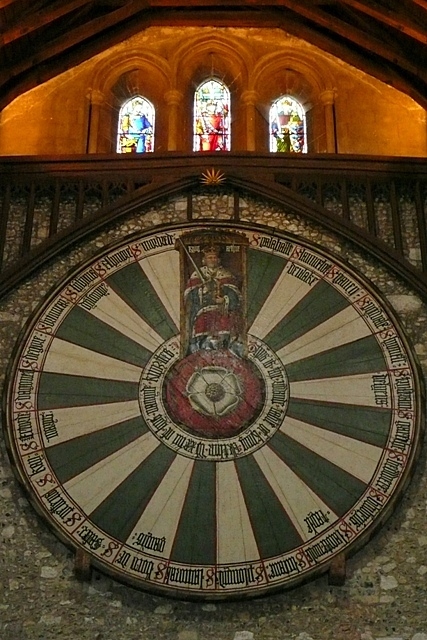 To impress Charles 5th of Spain, his great European rival linked to Charlemagne, Henry had the table painted, with the Tudor rose in the centre and the names of the 24 knights of the round table around the outside. And is that Arthur's portrait at the top? No, it is a likeness of a young Henry 8th. 16th century spin. As can be seen in these pictures SU4729 : The Great Hall, Winchester Castle and SU4729 : The Great Hall, Winchester Castle it is too high off the ground to make a decent dartboard. This page has been viewed about 1209 times.